Take a look at 15 stunning mehndi designs which are inspired by Indian summer motifs such as flowers and peacocks! Summer weddings come with their own share of fun and frolic. Such weddings are accompanied with lots of bright colors, enthusiasm and is buzzing with chirpy energy all around. When it comes to mehndi designs, this year has been all about super trendy chic-minimalist-pattern of mehndi designs. From brides to bridesmaids, everyone seems to have fallen in love with these designs that are an absolute delight to look at. Here’s a collection of 15 super gorgeous designs inspired by summer that you can flaunt on weddings. Whether it’s an indoor wedding or a destination wedding at a beach, these designs go well at all locations and with all kinds of outfits. 1. Floral mehndi designs: This is the most elegant amongst all the options. 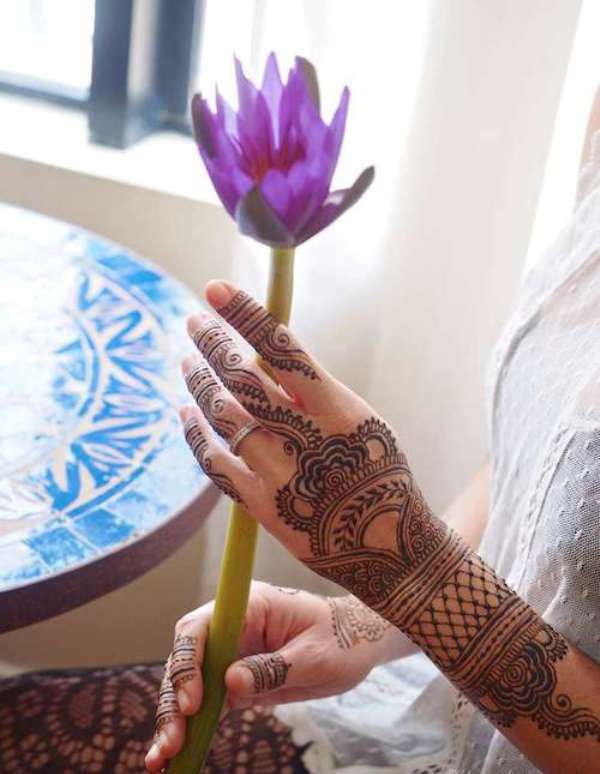 This design includes a big gorgeous flower at the center of the palm and is accompanied with different types of floral and leaf patterns and shapes. It is traditional and looks great with Indian wear. It is inspired by Arabic and Pakistani designs. 2. Peacock motif mehndi designs: Mehndi design with peacock pattern has been used since ages. It is one of the most preferred illustrations besides the floral patterns. It has mostly been included as a part of the overall design but with changing tastes and preferences, there are plenty of modern mehndi designs that use only peacock as the central theme. These stunning designs look really creative and modern. 3. Rose motif mehndi designs: Rose motif when included in a mehndi design look sophisticated and gorgeous. These designs have started gaining popularity only in the past one year. The designs are difficult to draw and only an expert mehndi artist can do it for you. You can either use only roses or combine them with different shapes and patterns to cover the entire hand. It is bound to surely fetch you some compliments. 4. Wrist mehndi designs: These hippy looking designs are a hit with girls who like to flaunt modern and minimalist patterns. These designs focus on the wrist area and give an appearance of a beautiful wrist band/bracelet. 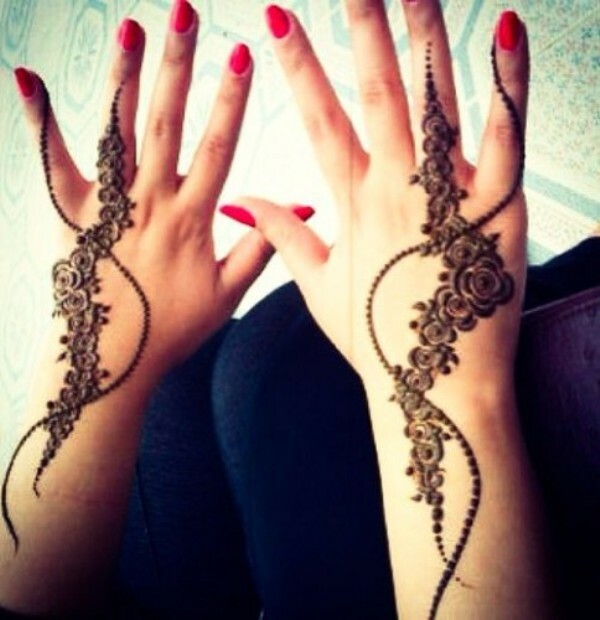 Wrist mehndi designs are modern and are perfect for cocktail parties or destination weddings when you want to don a gown. Paint your nails with fun and summery colors to accentuate the design. Intricate patterns are all-time favorite designs, but the trend of using designs that add a little bit of zing and matches the chirpiness of summer wedding atmosphere is catching up. In the past few years, you must have come across various new mehndi patterns such as Arabic designs, Pakistani designs, Moroccan designs, besides the traditional intricate Rajasthani and Mughlai designs that are commonly used in Indian weddings. Take your pick from the above stunning options as all these would look good on your hands.